Just like campus classes, all of our online courses and clinical rotations give you both theoretical and practical knowledge to ensure your success in the real world. You’ll learn from board certified physicians and technology faculty, who not only understand the concepts of providing a online medical education, but are recognized as the top medical professionals in their field. By the time you have finished your program, you will have learned how to operate the most advanced diagnostic technology available today within the Neurodiagnostic field. 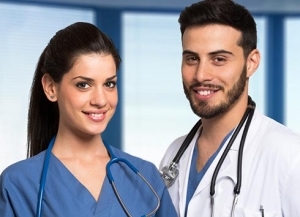 More importantly, you will have become a valuable member of the health care team and a valued asset to your employer. With local clinical rotations, as well as online learning, The Institute of Health Sciences makes quality medical education highly accessible. Whether you’re seeking a career in Electroneurodiagnostics, or within a sub-specialty, we can help you reach your goal — and much sooner than you might expect. There are certain (standard) computer features and programs you will need in order to participate in courses offered by the Institute of Health Sciences. Below you’ll find a list of these requirements along with additional tips about helpful plug-ins. Keep in mind, each program will need “space” on your computer and, therefore, has it’s own set of system requirements. Please refer to the Portal FAQ page or contact us with questions you may have. » Click HERE for additional information!